Turkish and Russian foreign ministers met in the Russian city of Sochi Friday in an effort to boost the process of normalization of bilateral ties. Mevlut Cavusoglu became the first Turkish minister to visit Russia since the Nov. 24 crisis began when Turkey downed a Russian plane that violated its airspace. 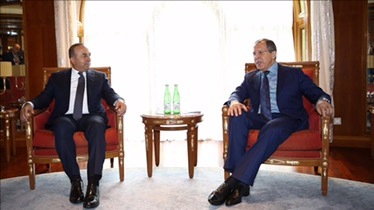 Cavusoglu held a private meeting with Foreign Minister Sergey Lavrov at the Rus Hotel, where the Black Sea Economic Cooperation meeting is taking place. In remarks made to the media before the meeting, Cavusoglu highlighted Turkish President Recep Tayyip Erdogan’s letter and phone call to Russia’s President Vladimir Putin, moves which he termed as “positive”. “We have been ordered to follow topics discussed during conversations between the two presidents in order to take the relations on a desired level,” he said. The two top diplomats, who last met on Dec. 3 in Belgrade during the Organization for Security and Cooperation in Europe meeting, later held their private talks, which lasted 36 minutes. After the meeting, Cavusoglu answered journalists’ questions and evaluated the agenda. “We had a meeting with Mr. Lavrov [on] how to handle the process from now on and how to implement the decisions that were taken,” Cavusoglu said. Cavusoglu said mending relations between Turkey and Russia would also have effects on the Syria crisis, which has entered its sixth year. When asked if there is a schedule on lifting the Russian ban on Turkish products and travel, Cavusoglu said the bans were being lifted “even before” the letter from Erdogan or the phone call with Putin.